Fluorescence - Basic Yellow 40 on a vehicle cowling. Digitally photographed and enhanced. 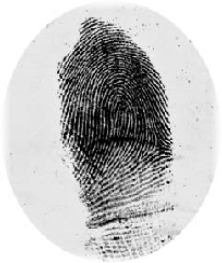 Fingerprint photography requires both simple and complex lighting and the final prints are produced in black and white at ratio of 1:1. Since 1992 Neate Imaging has researched different light sources; the aim of which was to find specialist lighting which would provide forensic photographers with a complete set of tools for the photography of simple and complex fingerprint impressions. In the next section we will show you some of the types of lighting, and show examples of their use. Lighting always begins with colour filters . it is often assumed that digital replaces conventional photography, in reality it merely compliments it. Colour filters provide an invaluable tool to the Fingerprint photographer; all images are photographed in colour and then converted into black and white. In the black and white image, the colour becomes a shade of grey. Colour filters can be used to lighten or darken the grey shades, for example red in black and white becomes almost black. Therefore if the fingerprint is black and the background is red, the final image will have a black fingerprint on an almost black background. A red filter will remove the green and blue wavelengths of light resulting in a final image showing a black fingerprint on a white background. 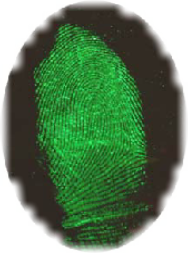 The primary filters required for fingerprint photography are red, green, blue, yellow and daylight, a filter will have the effect of removing it’s self and increasing the intensity of it’s opposite colour. 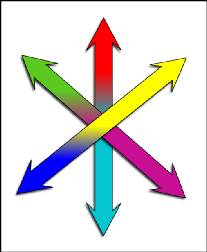 The diagram below shows a red background in the original image, a red filter removes the green and the blue but allows the red tobe transmitted. The final BLACK AND WHITE image has white background, without the filter this would have been almost black. Although many enhancements are possible in the ‘digital world’, the best results are always obtained if the image is photographed using the best available techniques. 1. 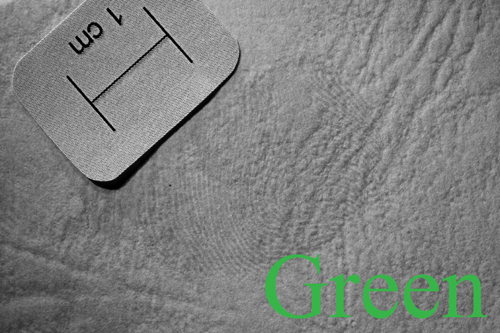 Backlight for photographing Aluminium Fingerprint lifts, and for spectral illumination. 2. Ringlight with mini magic arm stand, for surface lighting. 3. Goosenecks for oblique illumination - especially useful for curved surfaces. 4. Dark field ring-light - angled fibre bundle for fingerprints in 3D surfaces such as putty and dust. 6. Dark field illumination box, for fingerprints on clear plastic surfaces. 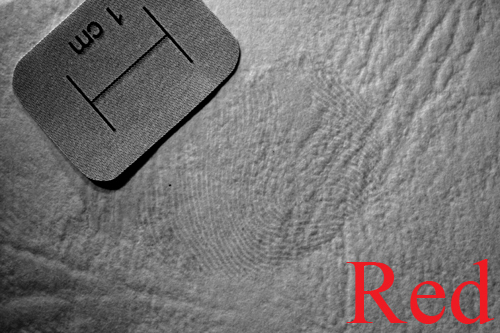 The following three images show a fingerprint impression developed with RTX on a pale orange background. It has been photographed with a red, green and glue filter and subsequently converted into grey scale. 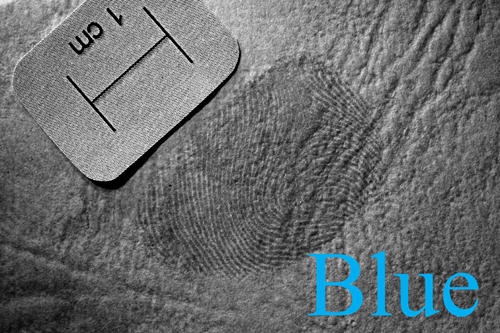 Have a look at the images and see which produces the best information, the fingerprint is a dull yellowish brown colour so I would expect the blue filter to produce the best result..